How about some late-night accountability?! In case you missed it, Matthew and I ran the Charles Street 12 last weekend. After the race, I posted on instagram my thoughts about my performance. In short, I felt like crap. I didn't feel strong or accomplished; I felt tired and uncomfortable. I know it's the lack of training that led those feelings. I barely ran in August- how are you supposed to feel great about something you barely do? So these past two weeks I've tried to go back to what works: running three times a week, strength training, fueling my body with the right amount of healthy foods. Thursday- 3 mile run, 10:22/10:18/10:05 splits. Core work and planks. 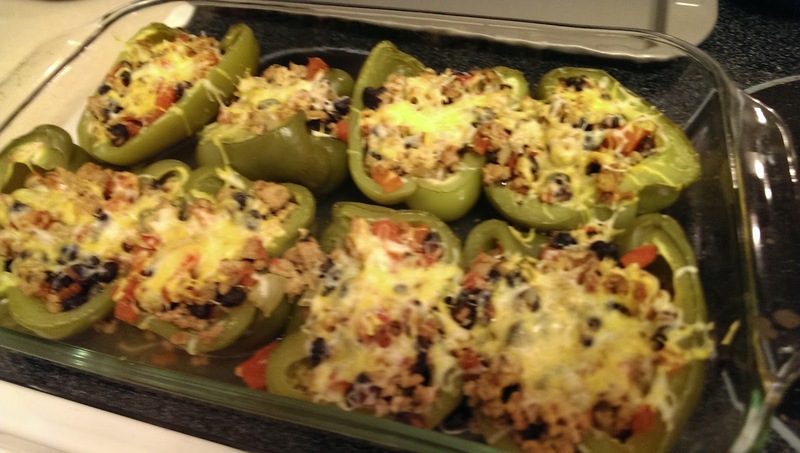 So I made Skinnytaste's Turkey Santa Fe Zucchini Boats... except our grocery store had really small, wimpy looking zucchinis so I made them as stuffed peppers instead. They turned out pretty well! +3 pounds since last week. I have no idea what's going on with my weight right now. I've consulted my Weight Watchers Leader and some of my WW friends but there's no real answer. I've been making good choices, working out, and limiting my splurges. I can't explain this weight gain. Instead of focusing on what I can't control (the scale), I'm focusing on making the next right decision; whether that's choosing what to eat, working out when I don't feel like it, or walking away from the many treats that are constantly in my office. A few weeks ago I tried "golf" for the first time. 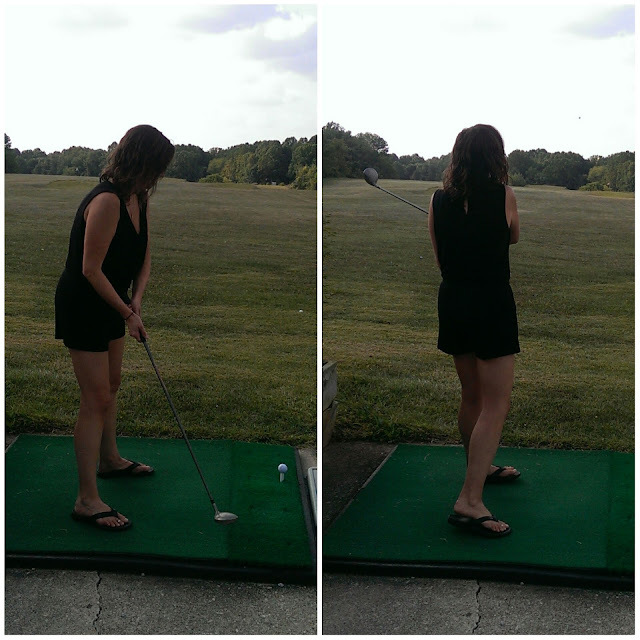 Basically, we went to the driving range and I actually hit some balls! And I enjoyed it! It was way out of my comfort zone but I'm really glad I tried it. You can actually see the ball in the upper right hand corner! Do you golf? Have you ever visited a driving range? So interesting fact that I didn't know, but when I was talking about my struggle with my weight, my therapist told me that our brains are programmed to us at a certain weight. And it takes SEVEN YEARS for the brain to adjust. So even after you lose the weight and are doing the right things, our bodies are trying to sabotage what we are doing because it wants us to maintain a weight that we were at before. I'm not sure how true this is, but it makes some sense to me. Keep up the great work! You are definitely an inspiration to me. Hopefully I can be as successful as you, although I'm trying it without Weight Watchers this time. Thank you, Jen! That is an interesting thought! I, too, feel like my body is just so much more comfortable in the 170 range- that's about where I was before I started gaining and losing about 10 years ago. I will try to remember this and not be discouraged by the lack of progress and just chalk it up to my stupid body not getting the memo :-) Thank you for passing it along! Training Plan?! Who Needs a Training Plan? !